Part 2 of a three-part article on best practices in energy benchmarking as more cities and states make it mandatory. Today, many companies serious about utility cost control also track energy consumption in addition to energy cost. This approach tracks electrical consumption and natural gas consumption based on square footage — ignoring the cost factor. One way to do that is to track energy consumption in kWh for electricity and therms for natural gas, with both based on square feet. That way, facility managers can compare buildings by kWh/sf. 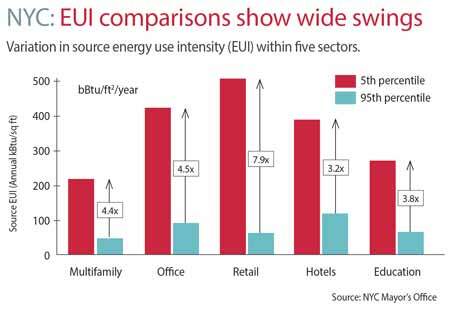 Another benchmarking option is energy consumption in British Thermal Units (BTU) per square foot. To make the data easier to read, this can be turned into EUI, measured in thousands of BTUs per square foot (kBTU/sf). This EUI measurement tool ignores the cost of energy and the relative cost of electricity compared to natural gas. Comparing EUI can lead to some surprising results. Many older buildings are more efficient than newer buildings. Some buildings that are not LEED certified are more energy efficient than LEED certified buildings. But EUI is not the whole story. 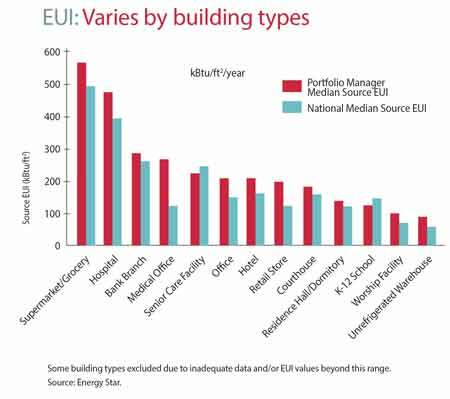 EUI varies by building types. For example, a grocery store has a much higher EUI than a distribution warehouse. The type of energy-using equipment in certain buildings varies widely. Some buildings have full HVAC for tenant comfort (office buildings, for example), and others (like most warehouses) only have heating. In some buildings, electricity or natural gas is used for production (for instance, restaurants, full-service hotels, and manufacturing plants). What’s more, regional climate also has an impact on energy consumption. An office building in Florida might use a chiller for its air conditioning needs 11 months per year, and another office building in Minnesota might only need to run a chiller a few months a year in the shorter summer season. Water-side and air-side economizers also provide “free cooling” during some winter months so the chiller can be turned off. Two buildings may have comparable kWh consumption but one may have lower cost due to thermal energy storage (where ice or chilled water is made during off–peak times with lower cost electricity and used to cool the building during the day, when rates are higher). Portfolio Manager solves both of the problems related to EUI. The Energy Star score is based on a building’s energy consumption compared to similar buildings. It tracks electrical consumption and natural gas consumption based on square footage — ignoring the cost factor. Portfolio Manager adjusts for such factors as building type and regional climate. 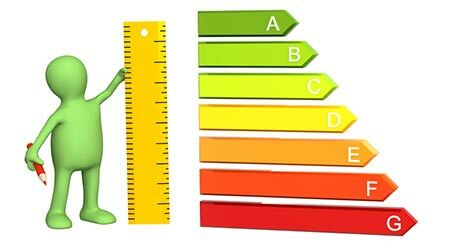 The result is a true apples-to-apples comparison that can be used to guide plans for improving energy efficiency. If energy benchmarking is done correctly and is followed up with action, a facility ends up with lower energy costs, lower maintenance costs, and better lighting or better comfort or both, and in the process improves the value of the building. Portfolio Manager can also be used to track water consumption and waste, the latter a recent upgrade.